Easter Slogan Button Badge. This green and white striped badge has the slogan Official Egg Hunter written in fun bubble letters and lots of colourful Easter egg illustrations at the bottom. Our 1-inch Easter badges help spread a little Easter joy & make lovely handmade alternative Easter gifts. You could also use our badges in your Easter egg hunt or as fun keepsakes in Easter party goody bags. With hundreds of Easter and Spring themed badges in the shop we are confident you will be spoilt for choice. 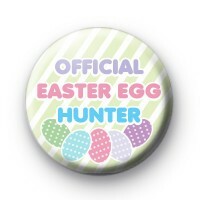 So make sure to browse through our Easter Badge category before checking out.